That is all that can describe what happened. Pathetic attempt, if you could even call it that. We played three teams today. OU, USC, and the Referee Team. OU had 5 turnovers. USC scored on each turnover. The Ref Team clearly called the game in favor of USC. In fact, I would go so far to say that the Orange Bowl had the best refs that USC money could buy! Not sour grapes; just my perspective. I wish we would have at least shown our talent, instead of our hiney-ends. 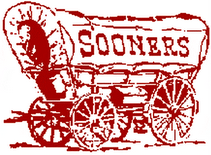 Boomer Sooner, always and forever!